NBC host Savannah Guthrie confronted Donald Trump Monday morning about why he took credit for predicting that another terrorist attack would happen on US soil. The presumptive Republican presidential nominee tweeted shortly after the Orlando attack that he was thankful for supporters who congratulated him for “being right” about the dangers of terrorism. On the ‘TODAY Show,’ Guthrie pressed Trump to respond to critics who asserted that he was making the attack about himself. “To a lot of people that struck them as unseemly, that at this moment that 49 people lay dead, you were focused on yourself, and giving yourself congratulations. What do you say about that?” Guthrie asked. Guthrie didn’t let up, pointing out that most people understand that another terrorist attack is likely to take place at some point. “In fairness, literally everyone predicts that there will be another terrorist attack. There’s no one who doesn’t recognise that that’s not the world we live in,” Guthrie said. 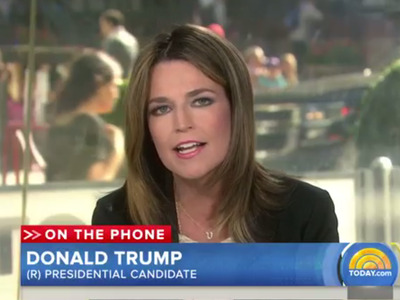 Guthrie wasn’t the only one to push Trump over his controversial comments. “I don’t want congratulations. I want strength, I want vigilance. I want people to report when they see something bad. The last thing I want is congratulations. I was right. And I have been right, and I am right,” Trump said.